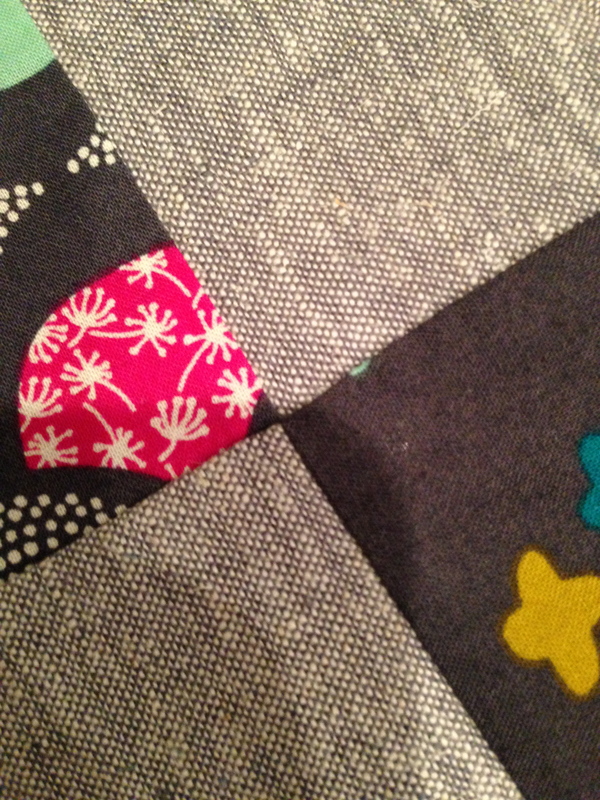 I’m working on another quilt for Cloud9 Fabrics, and I realized last night that I never quilt alone. This quilt especially–maybe because I’ve been spending so much time planning with the NJMQG–has been a group effort, and my partners don’t even know it. During the design process I want to make sure that everything is clean and bright and pleasing to the eye. So I channel my inner Daniela. And Beth taught me a lot about fussy cutting and planning for the size of a print, so I think of her when cutting. My LQS was out of Warm N Natural batting when I needed it, so I tried out some Quilter’s Dream on Peggy’s recommendation. It is luxurious, so I thought of her while basting. Ashley has already professed her love for the fabric I chose as backing, and I’m using a quilting design that’s close to one of her recent finishes, so she’s been on my mind as I quilt. And Stephanie makes the most gorgeous binding. I’ll try to channel her while I bind. This doesn’t even mention everyone who has inspired me, or who I’m making the quilt for. Or all of the generations of quilters who inform the craft or my family. The people who shaped my mood that day. The awesome girls at the fabric store who humor me as I pace around and make decisions. Even though I usually sew by myself, I am never ever alone. Slippery slope, indeed! Lol! Excellent work my friend! 🙂 P.S.- can we quilt together for real soon? Thanks for this reminder. I am “self-taught” on the shoulders of so many who’ve shared their work and knowledge. Books, websites, TV shows… And friends. No, I haven’t taken many classes, only a couple. But as with you, I am surrounded by others, always. Thanks again.